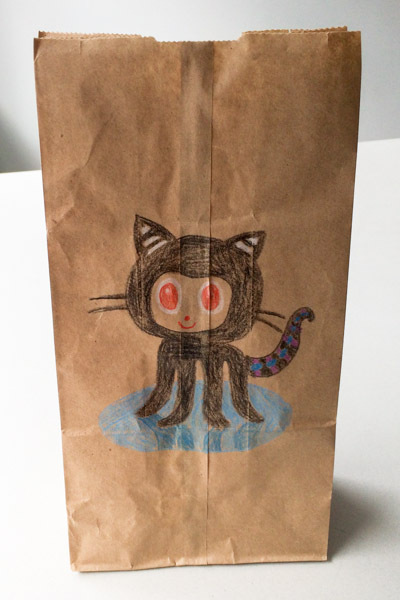 The GitHub mascot is known as an 'octocat' — a cross between two very intelligent animals. I drew the one above for you, dear reader. Summary: A brief overview of Git and GitHub followed by pointers to instructions on creating your own personal website hosted at yourusername.github.io for free. Git is software for version control of files to help a person or a group of people do, publish and keep track of their work.1 One of the best things about Git is that it is free, open source software. This means that it will always be available regardless of whether a company still exists. GitHub is a website that provides a good user interface for Git software. It is used by companies like Google — https://github.com/google — Facebook — https://github.com/facebook — and Apple — https://github.com/apple. One of the people2 who created GitHub wrote a parable that helps us see how it works. One of, if not the best, thing about GitHub is it makes it easy for anybody to use Git! Go to https://github.com/join and create an account. Make note of the username you choose. Adding more pages to your site. Changing the look of your site. Working on your own computer and synchronizing your work with your GitHub repository which then updates your website automatically. Registering your own customdomainname.com and pointing it to your GitHub pages site.